It is true that in it Ambedkar advised the Hindus to grant the Muslims of India Pakistan. But the reasons he adduced to support this suggestion were, to put it mildly, rather uncharitable towards Indian Muslim society and politics. It was last year when I was strolling about on the campus of my alma mater – Jawaharlal Nehru University – immediately before or after International Women’s Day (I do not exactly remember). Suddenly, a poster stuck on one of the unplastered bare brick walls, so characteristic of the construction on the JNU campus, caught my attention. It had been released by the Bhagat Singh Ambedkar Students’ Organization (BASO) to mark 8 March. All students’ organizations active in the JNU release posters or pamphlets around Women’s Day to affirm their commitment to gender equality and women’s rights and the BASO had not been an exception. The imagery employed by this poster was such that I drew out my phone and clicked a picture. It bore the drawing of a hijab clad young woman and “saluted”, along with some other women, Hadia (presumably for struggling against patriarchy). Now, let me observe, at the risk of causing umbrage to a lot of people in the academia, that the hijab is perhaps more of an emblem of a woman’s subjection to patriarchy rather than her struggle against it. Coming to Hadia, the reader might know that she was formerly known as Akhila. She changed her faith under rather dubious circumstances and married (or was married to) a man equally dubious. In 2016, her conversion and marriage had occasioned a court case as well as a massive public controversy since her parents doubted if she actually exercised any agency during the entire affair. I think that the BASO could have left her out of its list of women who according to it have cocked a snook at patriarchy. Though the BASO seems to evoke Bhagat Singh’s revolutionary legacy, to me it appears to be mainly into ‘Ambedkarism’ – I say this on the basis of what I have seen of its posters and pamphlets in the JNU. What is ‘Ambedkarism’? Simply put, it is the pursuit of, what is in the eyes of the ‘Ambedkarite’ (a believer in ‘Ambedkarism’), social justice. This social justice could be in the form of, to borrow words from Valerian Rodrigues, editor of an omnibus edition of Dr. B. R. Ambedkar’s writings, “equality of consideration, equality of respect and equality of dignity.”[i] On the basis of the aforestated, to what extent is the image of a hijab clad woman an appropriate motif for the BASO’s ‘Ambedkarism’? Not quite, since Ambedkar would definitely have thought that such a woman is socially privy to neither consideration, nor respect, nor dignity on the same level as a man. The BASO, through its mischievous choice of imagery (and identification of Hadia as a challenger of patriarchy) was actually promoting Islamism in the guise of ‘Ambedkarism’. As far as pairings go, that of Islamism and Ambedkarism is a very odd one. It sure would have made Ambedkar cringe as he had once done a very thorough critique of the regressive and supremacist social and cultural attitudes prevalent among Indian Muslims and their application in politics (that is what Islamism is). But we do not know of this side of Ambedkar since it embarrasses our politically correct academia. It has studiously concealed it from public knowledge while ceaselessly tom-toming Ambedkar’s critiques of Hinduism. 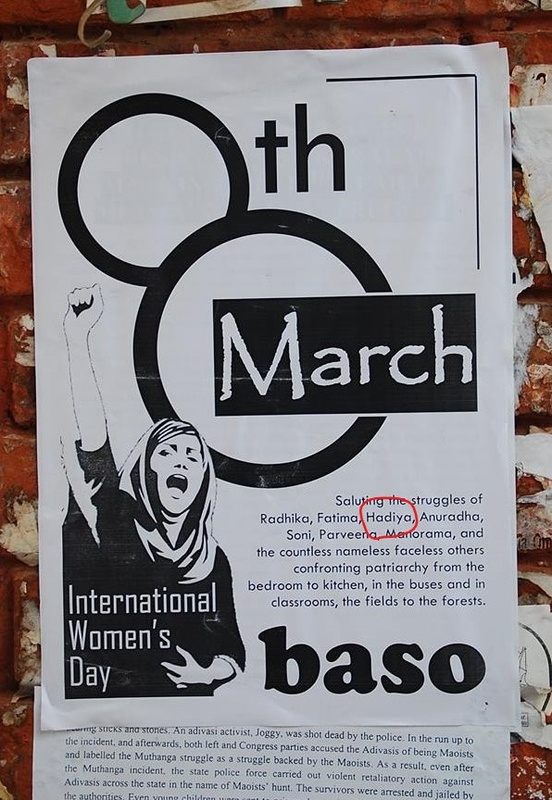 Last year, the ‘Women’s Day’ poster of the Bhagat Singh Ambedkar Students’ Union featured a hijab clad woman and identified Hadia (name circled in red) as a feminist icon. In the year 1940, soon after the Muslim League passed the ‘Pakistan resolution’ in its Lahore session (on 22 March), Dr. B. R. Ambedkar came up with a lengthy study titled Thoughts on Pakistan. It was republished in 1945 as Pakistan or the Partition of India (henceforth PPI). The biographers of Ambedkar barely tell the reader what is contained therein. Gail Omvedt writes that in this work Ambedkar concluded that “the creation of Pakistan was inevitable” due to the “developing political mood of Muslims.”[ii] Eleanor Zelliot terms it Ambedkar’s “defense of the idea of a separate Muslim nation” as the Indian Muslims “were emotionally a nation.”[iii] By displaying an understanding of the Muslim demand for Pakistan, Zelliot further (disingenuously) argues, Ambedkar indicated that “Untouchables and Muslims shared a sense of separateness, of isolation….”[iv] Christophe Jafferelot, author of a volume of essays on Ambedkar (Dr Ambedkar and Untouchability. Analysing and Fighting Caste), does not at all mention PPI anywhere. Valerian Rodrigues does in his introduction to The Essential Writings of B. R. Ambedkar, but he barefacedly lies about it. He says that in PPI Ambedkar suggested that “the appeal of Pakistan for the Muslim masses” was due to the “failure of Congress to strive for social reforms and democratize society.”[v] However, his selection from Ambedkar’s writings does include an excerpt from PPI. Rodrigues gives it a title of his own devising – ‘Is There a Case for Pakistan?’ Mind you, in the original volume there is not a chapter, or even some section of one, bearing such a rubric. This excerpt has been strategically chosen (without the context being sketched out) to convey to the reader the impression that Ambedkar was recognizing that the Muslims of India share a unity of emotions and consciousness and, consequently, was conceding their claim to nationhood (as Zelliot too will have us believe). The actual reality of PPI is not quite that. It is true that in it Ambedkar advised the Hindus to grant the Muslims of India Pakistan. But the reasons he adduced to support this suggestion were, to put it mildly, rather uncharitable towards Indian Muslim society and politics. One could term Ambedkar’s reasoning a very thorough critique of them. That is why, dear readers, the aforementioned learned people are so queasy about PPI. They barely, or not at all, touch upon what is in it. One even lies about it. They do not want us to know what this text really contains. Ambedkar wanted the Hindus to accede to the Pakistan demand because, due to a variety of reasons, he thought that an independent India with a large Muslim population will be an impractical idea. Hence, he argued that it will be better if the Hindus willingly let go of the Muslim majority territories in the North West and East of India which the Muslim league wanted to constitute as Pakistan (present day Pakistan and Bangladesh). He observed that the Muslim majority territories of the north have no “spiritual unity”[vi] with the rest of India. “Indeed”, he wrote, “there is more spiritual unity between Hindustan and Burma….”[vii] What had caused the spiritual alienation of these Muslim majority territories from the remainder of the country? For Ambedkar it was the outcome of the bloody invasions that India had suffered over the many centuries. He was no negationist and held that those who led these invasions – Mahmud of Ghazni, Mohammad Ghori, Taimur, Babur, Nadirshah and Ahmadshah Abdali – “were all united by one common objective and that was to destroy the Hindu faith.”[viii] To achieve this end they had been extremely cruel and barbarous resorting to, in his words, “destruction of temples and forced conversions, with spoliation of property, with slaughter, enslavement and abasement of men women and children….”[ix] While these memories caused the Hindus shame, for Muslims they were “a source of pride.”[x] So, a lot of Indian Muslims, as seen by Ambedkar, were not just uprooted from their parent civilization but even took pride in their state along with the agents and events that had brought it about. Here I must tell the reader that Maulana Mohammad Ali was a close associate of Gandhi and features in academic mythology as a ‘nationalist Muslim.’ A little thing more, we can say that Ambedkar made the foregoing criticism of Indian Muslims as a non-Hindu since he had made public his intention of leaving Hinduism in 1935. Ambedkar was not being a partisan on behalf of the Hindus; he was more like a neutral observing the politics that informed the relations of the Hindus and Muslims at a remove. Epilogue: Why the attempt at Islamist ‘Ambedkarism’? As we saw above, Ambedkar was very comprehensively critical of what one can term the Islamism of the Indian Muslims. Then why did the BASO make that devious attempt at Islamist ‘Ambedkarism’? It is highly unlikely that the folks in the BASO are unaware of the existence of Pakistan or the Partition of India. All in higher academia know of it, it is only that they do not tell the common public about this text so that Ambedkar can be presented as someone who only lambasted the Hindus and Hinduism. The reason why we see the BASO dishing out ‘Ambedkarism’ with a dose of Islamism is because it is an enterprise run by Mr. Umar Khalid (of 9 February 2016 fame). You see, dear readers, in recent times there has been an incursion of the Islamists into ‘Ambedkarism’. This is because it allows them to wish death upon the ‘Brahamanical fascist’ Indian state while posing as social progressives. This infiltration could also take place in the first place because several radical ‘Ambedkarites’ are on the same page with the Islamists (in the JNU at least). I, for example, closely knew this Maharashtrian ‘Ambedkarite’ in the JNU who once piously hoped before me that one day the ‘Brahmanical’ Indian state will disintegrate. Beware, dear readers, these days ‘Amebedkarism’ is the preferred subterfuge for a lot of the ‘breaking India’ elements. [i] Valerian Rodrigues (ed. ), The Essential Writings of B.R. Ambedkar, OUP, New Delhi, 2018 (twenty-first impression), Introduction, p.21. [ii] Ambedkar. Towards an Enlightened India, Penguin Books, 2008, p.94. [iii] Ambedkar’s World. The Making of Babasaheb and the Dalit Movement, Navayana, New Delhi, 2004, p.188. [v] The Essential Writings of B.R. Ambedkar, p.13. [vi] Pakistan or the Partition of India, Samyak Prakashan, New Delhi, 2013, p.81.